The desire of every employee is to do their job (I would like to exempt some government workers from this 🙄), find favour in the sight of their employers (and colleagues) and get paid (on time) at the end of the month. Sometimes, it’s smooth but most times you find it difficult to find a balance and be that good employee the bosses can’t stop talking about. Just now, I realized it’s been one month, 6 days, 16 hours and 7 minutes since I started working. It has been an interesting ride, I must say, and in this time, I’ve learned a few things I would like to share: 3 things I believe have helped made the past one month exciting and also helped me manage to be among the top three new staff (I gave myself this award, by the way 😎 ). Let’s dig in, shall we? Or make friends. Take your time to study each colleague well. I cannot begin to emphasize how important this one point is, but just know that a lot depends on the person or people you choose as friends. Top on the list is the fact that you will have your peace of mind when you know the kind of person you are getting involved with. When I started at work, I knew this already so I maintained a little distance from the rest as I got to know them more. Gradually, I realized that with the kind of people I had as colleagues, it was best to maintain neutral grounds with everyone, you know, put them all on the same level and treat everyone equally. But apparently, I didn’t try hard enough. There is only one male teacher in the school. The rest are either drivers or security guards. I was on my own when this man began to call me his crush o. I thought it was a joke and so I didn’t give it much thought. But it seems he is pretty serious. Today, I had just finished taking my class a lesson on pronouns and so there were a number of sentences on the board. He came over and said, “Crushy, read the second sentence on the board.” I looked up and the second sentence read: I love you (I and you are pronouns). I ignored it and read the penultimate (don’t look for your dictionary joh… It means second to last) sentence which read: it is a good dog (it is a pronoun. Wait, will you people pay me for this free lesson I’m giving? 🙄). I made the mistake of allowing myself get close to him, now I have to pay. But this is nothing compared to the cliques that I have seen be formed by the new staff and the kind of trouble they keep getting themselves into. Last week three friends happened to be on duty at the same time and they managed to get themselves to repeat their duty this week because of small talk and gossiping that did not allow them to do their duties well. I’m like a lone wolf, but my peace of mind is priceless, walahi. So please, choose your friends wisely. This goes without saying but I’ll say it: do the work that you were employed to do. One thing with my job is, the people in charge take their work seriously and expect you to do the same. They check too. So it’s best to just do what you ought to do and be good at it. That simple. I was employed to be an English teacher, at least that is what I was told as I was being employed. I resumed, however, to realize I would be taking computer, Basic Science and Technology, and Handwriting. And then the classes I teach have been changed multiple times, too. This is one of the things I feel have been most helpful to me as a teacher but I believe it’s equally important in every place of work. Be prepared at all times to change your plans as far as work is concerned or to take on responsibilities that are either not yours or that you normally would not take. So be flexible. Be ready to change form and shape as desired of you. If you are round and they want you to fit into a square hole, square up, biko. Remember the lady at the interview that kept telling me about her qualifications but rejected the job because of the amount they offered to pay her? Yes. Someone said in the comments that I was offered way more than she was because I had more to offer. It’s true. Learn new skills. If you have to, attend online classes (like I do), if you cannot afford them, use Google (like I do, too), but make sure you are adding so much value, they would do anything to keep you. I’m not quite there yet, the do-anything-to-keep-you part, but as long as I work here, I intend to be priceless. Presently, I am managing the school’s media pages and so far it’s been great. In addition, I’ve become the school’s unofficial photographer (I’m doing magic with my phone o) and just today, I learnt that my salary is 5k more than that of those with whom I was employed. And then, I’m going out of my way to prepare the kids for the spelling bee competition. They just wanted to teach the kids the spelling of those words but I said it wouldn’t make sense to know how to spell big words whose meanings they did not know. So, I took it upon myself to write the meaning of all those words alongside the words. See, I’m adding value. Congratulations! But you take four subjects?! I’m currently multiplying your salary by 4… Lol. I am not a graduate yet, but I can’t wait to start earning for myself. I’m already job hunting… Good luck and I hope you enjoy working as time goes by. For Nysc I really didn’t want to teach o but getting to my ppa and seeing how half baked the students are is motivating me to give them my best and add value to their lives. I love that you are using your skills to develop the school and I totally believe in studying people before becoming friends with them. I made a terrible mistake of not doing that my first week in camp and girl did I pay dearly for it, yes I did. Maybe I should blog about it sef. Just maybe. As always you add humour to your posts and make us all smile even while reading something so educative. Kudos NFG. Thanks, Gift. I’m not sure anybody wants to teach during the service year, but it’s always worth it after a while. Sigh… You make me want to be more. You might not know, but you push me. I feel like I have purpose when you say things like this. You light a fire that I can’t even explain. You have no idea what you’ve done for me. Lol. I can genuinely say I enjoyed reading this post. I can tell you’re a great teacher. I’m a lone wolf too. Being the same level of nice to everyone does it for me. Wishing you the best of luck! Enjoyed reading this. Best of luck teacher! I laughed so hard, Amaka. My skirts are behaving these days sha. Thank God! I’m glad things are moving fine, too. And I appreciate your comment a lot. I have a teeny weeny problem with being flexible. It’s just a thin line from being taken advantage of especially if the condition doesn’t bring extra benefit/knowledge/skill. But it’s working well for you I can see, and most especially, you’re happy doing all you’re doing. God bless your heart sugar and keep doing you. 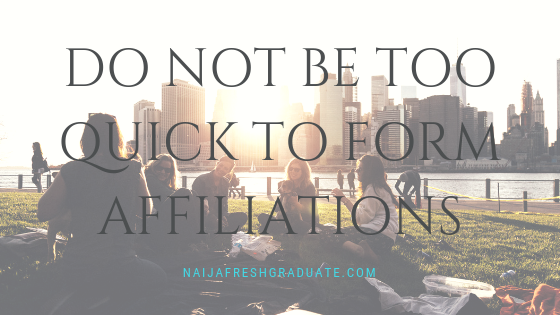 Your tips are totally true, especially the first about holding up on affiliations. Trust me, I know when I’m being taken advantage of and if I see the signs, I know just where to draw the line. But it’s true that some people might have difficulty knowing when one becomes the other. I guess the trick is to have a mind of your own enough to know when you’ve had your fill.